Definitely one of the most known buildings on the island is with no doubts the House of Columbus. But did Christopher Columbus really own this house? The history of the house dates back to the 15th century when it used to serve as a residency of the island’s governors. According to some of the historical sources Christopher Columbus possibly stayed in the house when during one of his voyages to the “New World” one of his ships needed to be repaired when sailing around the Canary Islands. He landed on the island and enjoyed the occasion to visit his friend – the governor Antonio de Torres. The actual shape of the building is a combination of couple of historical buildings of multiple centuries that were given the same façade, windows and stony decoration in the 50ties. The interesting result still gives us a unique example of a traditional Canary architecture with Roman and Arabic elements. The mission of the museum is to introduce you to the voyages of Columbus to Americas. Maquettes of the ships, nautical maps, instruments of navigation and another equipment of the sailors will take you to their world. There is even a reconstruction of the cabin of the admiral. Another exhibition hosts exquisite artifacts of aboriginal American cultures such as ceramics, seals, figures and funeral objects. Your idea about the connection of the Canaries and America can be completed in the library dedicated to this topic. The house itself with its beautiful patios and wooden balconies is an interesting overview over the Canary architecture and is decorated by many precious tapestries and valuable old paintings of various artists from 16th till 20th century. The museum is usually opened every day 10-18:00 (until 15:00 on Sundays and public holidays) and the entrance costs 4€. You could enjoy a free entrance if you manage to do your visit during the first weekend of the month. On Sunday mornings a little traditional market is normally organized in front of the house. ﻿ ﻿When you became bored on the beach of Las Canteras or possibly just too much sun burnt, maybe you could cool yourself down in an interesting historical site you can find in a walk distance from the beach. Yes, we have an important historical site even in our modern beach city! When walking from the beach, once you passed the port market, soon you will be impressed by an unexpected stony medieval fortress of Castle La Luz surrounded by a little park with a rose garden and a coffee shop from where you can see the exterior of the monument. 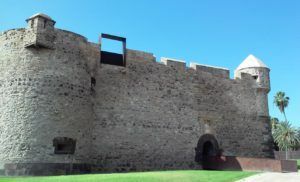 The origin of the fortress dates back to 1494 when the Spanish queen Isabel asked the third governor of the island Alonso Fajardo to build a defense tower. The tower still holds his name and it was build over the original wooden fortress constructed by the conqueror Juan Rejon from 1478. For long time it was surrounded by the oceans waters during the high tide eventhought as the city was growing later on it is now situated on a dry land and the ocean is approximately 150m far. The actual fortress shape is from the second half of the 17th century, its 4 walls are 23m long and 12m high. Inside you will find that original Fajardo tower that was only 10m high and 8m wide. When you finish your coffee in the neighboring coffee shop and decide whether you will pay the 4€ of entrance fee to the interior of the castle, you will be allowed to cross over the fortress little bridge and see the last reconstruction that started in 1998. 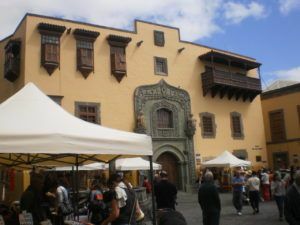 Nowadays the property is a combination of the old and modern and it hosts the permanent exhibition of 22 works of Martín Chirino – a very important sculptor born on the island whose unusual statues you can find also in the streets of Las Palmas such as the the one dividing San Telmo park and Calle Mayor de Triana street. His signature is the reference to the Canary aboriginal culture and the use of forged iron. My important advice: don´t forget your mobile and download a QR code reader before you go. The museum is so modern that most of the explanations are only available this way, but luckily there is a free wifi in all the monument. ﻿ ﻿ The village of Valsequillo is situated in the eastern midlands of the island in the approximate height of 600m. The numerous water springs make the diverse surrounding countryside green all year round and contribute to the prosperity of local traditional agriculture. If a nature lover, you will be amazed by the local landscapes full of colorful plants, especially by the unusual kind of blue tajinaste and many other indigenous plants. The municipality offers 9 different trekking routes of all levels to visit the local highlights and surroundings. The place is also perfect for a mountain bike cycling, trail running or horse driving. My favorite hiking tour is Barranco de los cernícalos, a Spanish expression for „Kestrel Valley”. This easy route is following a little stream with multiple water cascades. The way is bordered by lush vegetation and trees that keep you in a pleasant shade and if you’re lucky, maybe you will really see some kestrels. The village is very well known for its traditional gastronomical products, especially the cheese, strawberries, honey, wine and almonds. There is a shop on the main street where you can taste and buy some of the locally elaborated products. Try an almond mojo or the bienmesabe sauce. In the historical center of the village you would find an interesting church of Saint Miguel, reconstructed at the beginning of the 20th century. There is a valuable baptismal font from the 15th century and many old valued statues in the interior of the church. Together with the neighboring town hall and another old buildings from the end of the 19th and beginning of the 20th century the center of the village feels very cozy. If you wish to see something really old, when passing by the town hall, continue walking the street just a little bit higher. You will find a little view point from where you can admire a nice view to the mountainous landscapes and there is an old cavalry barracks from 1530 at the bottom of the valley. 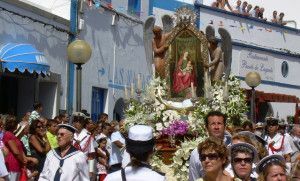 There are a lot of fiestas organized in the municipality, but if you happen to be in Gran Canaria right now, at the end of September, you shall not miss the most important one – the feast of Saint Miguel Archangel celebrated every year the 29th September, the patron of the village. 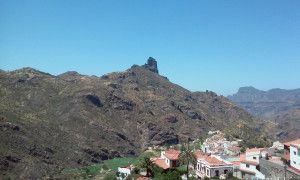 When visiting the mountains of Gran Canaria from the northern side, this misterious rock will always be visible on your pictures. With its height of 1414 meters above the sea level Roque Bentayga could be considered a little sister of Roque Nublo (1813 m), but it definitely does not mean that it is less important. After having the coffee in some of the mountain villages from where you would have amazing views over Bentayga, such as in Tejeda or Artenara, you shall absolutely go to explore it closer. I recommend you to start at the Interpretation Center close to its base. It is usually opened Tue-Sun 9:30-16:30. In this interesting small museum with a free of charge entrance you will undestand a little bit better to the prehispanic inhabitants of the island. On the modern explicative panels your will find a lot of information and pictures and you shall certainly take your time to see the approximately 10 minutes long video in multiple languages to be able to imagine the appearance, tools and life of these indigenous people. After absorbing all the necessary theory here comes the time to explore on your own. A 10-15 minutes hike similar to a typical “goats trail” you will take you up to a place called “almogarén” – a sanctuary of the aboriginal people. You will find small basins and chanels where the sacred liquids such as honey, butter or milk used to flow during the magical rituals to call the rains or fertility. The importance of the fertility is underlined by the paintings on the walls – mostly pubic triangles. The archaeological site of Roque Bentayga disposes of caves of all kinds. The prehispanic culture have been divided in 2 classes. The leading class of the nobles – owners of the lands and cattle, soldiers and religious leaders and the productive poor class. Obviously there is a difference in the caves that used to be habited by the nobles and caves that served for the plebeians. Another kind of caves used to serve as graineries to store the barley and other products for the times of recessions and others were used for burials. Thanks to the hight location of Roque Bentayga it probably used to have also an astronomical importance to be able to establish the agricultural cycles. At the moment we don´t organize any excursion to Roque Bentayga, but if you come for our Tuesday´s Gran Tour, you will definitely have amazing views of this Rock when visiting the mountain village of Tejeda. When visiting the beautiful medieval city of Agüimes, why not to learn more about the local history? Only the beautiful building itself of the museum will impress you by its historical background. It was built in the mid 18th century and it used to be the the Bishop´s Palace. Shortly after you pay the entrance fee of 3€, you will enter the first room that will help you to understand some of the details of the conquest of the island and how the lands had been divided between the conquerors, soldiers and new inhabitants of the area. 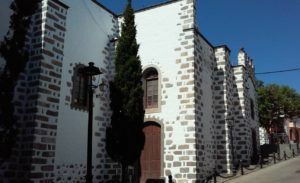 As Agüimes used to have the status of an episcopal lordship since the conquest untill the middle of the 19th century, part of the museum is dedicated to the religious matters. You will also learn about how the region is divided in various parts such as Agüimes, Ingenio, Carrizal, Guayadeque and Temisas and how the population grew from 500 inhabitants in the 16th century up to incredible 50.000 in the 20th century. The following room describes the hard times when the island was affected by the famine, plague and rebellions and a lot of inhabitants emigrated to places such as Cuba, Puerto Rico, Argentina, Venezuela or USA and how the island suffered depopulation of the middlands and mountains. You will also learn about the position of the woman in the society, about the local births, matrimony, death and there is a lot of examples of local superstitions and witchcraft. Finally you will end up several rooms whose exhibition will help you to understand the local economy. You will start by the domestic, kitchen and garden tools and you will find out that more then 12% of the households used to have a weaving loom so that the poor women could earn a bit of money. You will learn that meanwhile in the 16th centrury the sugar cane that used to form even 50% of the local agriculture, later on it had been replaced by cereals, corn, fruits, vegetables and olives to be the tomato the most important product in the 20th century by its 35% quotient. Somehow it seems like the goats and sheeps have always been breeded here in a range of 30-40% each. Apart of the agriculture there are also explanation boards of other sectors of the local economy such as lime kilns, salt pans, fishing, milling, oil presses and winemaking. What I founded really interesting was the restoration of the typical oil and vinegar shop. These stores from the mid 19th century replaced the work of peddlers who used to sell the products wandering on their mules, camels or simply walking. The museum is opened Tuesday – Saturday 9:00 – 17:00 and Sundays 9:00 – 14:00. In the summer time the opening hours are usually more limited. We can proudly call Agüimes a pearl Gran Canarian cities. Walking its narrow streets and admiring the beautiful facades of the old houses, you will breathe the medieval atmosphere of the town. Agüimes history started shortly after the conquest of the island have been finished and for long time it was getting special privileges. Since 1487 the town received a status of an “episcopal lordship” which means that it was controled by bishops, 45 in total. The bishops used to be the complete owners of the lands and the their products and could rent them and enjoy the benefits entirely. As a curiosity you shall know that the bishops also used to select the mayor and there was also another mayor selected by the government which leaded to many administrative troubles. Even though the episcopal lordship were cancelled in 1811, somehow in Agüimes this kind of administration survived untill almost 20 years later. The favourable conditions of the area enabled its population even in the prehispanic times especially the upper valley of Guyadeque, where the settlements were naturally protected from the possible enemies. The water sources allowed the agriculture to grow. At the beginning of the 16th centrury the village was profiting especially from the sugar cane, meanwhile in the 20th century the main product were the tomatoes, cereals, olives, vegetables and fruits. Nowadays economy is surprisingly not based on the tourism, but the flat areas where the tomatoes used to be produced once changed into a large industrial park that atracted new habitants to the city which now hosts more then 30.000. 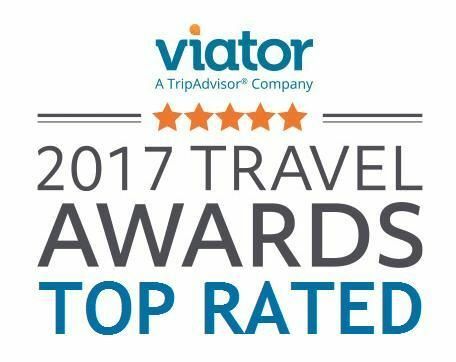 The city may not depend on tourism, but it offers a great experience on a day visit, or if you like, you can stay in a couple of cozy little rural hotels located directly in the historical center itself. The renovated streets and facades will make you feel like in the old times. Your artistic bone will get a special feed admiring the interesting statues decorating the streets and maybe you will learn a bit of Spanish reading the short poems written on the walls of the houses. The indispensable Church of Saint Sebastian was built in rather a long time period since 1787 till 1940 which helped to mix it to gothic, baroque and neoclassical style and replaced the old one from the late 15th century. Don´t forget to have a look inside the Information Center located in a 17th century house where you will understand more about the local history and even get a bit of archaeology (free entrance). 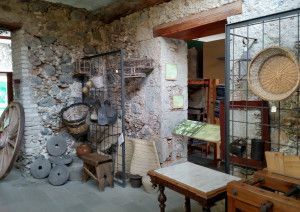 And if you long for more information, there is also an interesting museum of the history of Agüimes created from an interesting mid 18th century property that used to serve as a Bishop´s Palace (entrance 3€). 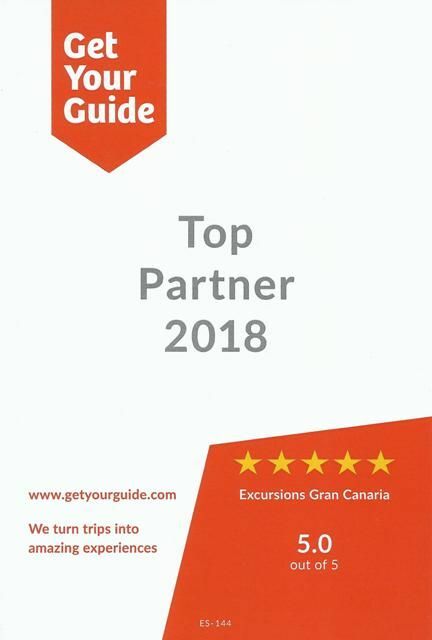 There are 2 buses from Las Palmas to Agüimes every hour, bus number 11 and 21 and there is a lot of lovely coffee shops and restaurants in the historical center to taste a bit of the local cuisine. August is here and that is the time when Gran Canaria loves to celebrate la Fiesta de la Rama. I believe everyone knows, what the Spanish word “fiesta” means, but what would you imagine beneath the expression “Branch Party”? Lets start from the begining. The 4th and 5th of August a sleepy little place of Agaete wakes up to celebrate one of the islands biggest fiestas that thousands of people from all over the island comes to commemorate. Nowadays we can consider this feast as a sublime combination of pagan and religion ceremony, but where is the origin of this event and why the branches? The celebrations start early in the morning (around 5 o´clock) at the 4th of August. 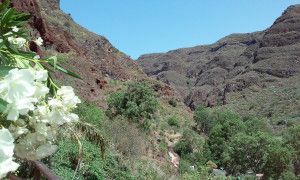 According to the tradition the participants should take a long and difficult path from the village, through the Valley of Agaete up to the mountains of Tamadaba to bring the branches of the trees. Why would they do it? Take it as a promise to the local Virgin. At the moment not everyone is ready to do such a pilgrimage in so far that the majority of the visitants start the ceremony way later (around 11 o´clock) waiting in the upper part of the village of Agaete for the arrival of the branches. 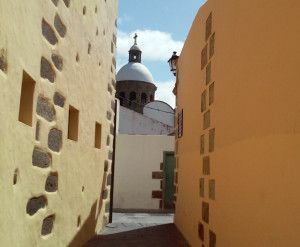 When the branches are distributed between all the pilgrims, the procession starts to move slowly throught the narrow streets of the village towards the picturesque port of Puerto de las Nieves. The pilgrims dance all the way down holding the branches above their heads, accompanied by sound of the local music band. The procession stops in front of the chapel of the Virgin where the last dances are performed and branches placed in front of the church to be an aromatic offer to the Virgin. The habit of bringing the branches was given long time ago already in the prehispanic times when the indigenous priestesses used to call the rain taking the butter and milk up to the mountains of Tamadaba, bringing back branches of the trees to hit the waters of the ocean by them. Afterwards the festivities continue the next day – 5th of August when another procession takes the painting of the Virgen to the church of the main village of Agaete where it stays untill the day 17th, when her excursion is being finished returning her in another fiesta´s procession back to the port´s chappel. Excited to visit? There is a bus nr. 103 from Las Palmas to Agaete once an hour eventhough during the days of the event it is usually more frequent then normally. All over the year we can take you to visit the picturesque port of Puerto de las Nieves on our Tuesday´s Gran Tour. Are you nature lovers and anxious to know who were these mysterious aboriginal inhabitants of Gran Canaria? Your way should definitely lead to the ravine of Guayadeque. There are 2 ways to arrive, one through Ingenio, another one from Aguimes. Both will take you breath when arriving and you will soon understand how can this place be so close and so isolated. Your first steps should certainly carry you to the interpretation center. Maybe that is why it was build by the entrance to the valley. From the outside it will give you an impression of a small thing, but shouldn´t we never judge the things according to its exterior? The entrance fee of approximately 3 euros will be your price to understand to the aboriginal culture in the valley and actually generally to the prehispanic inhabitants of the island. The building itself is very interesting as it was smoothly integrated and created from the settings that cannot be more traditional – inside a large cave. Here you will learn about how did the indigenous people look like, where did they come from, what tools did they use, what outfits they weared, what animals they used to farm, agriculture products they used to cultivate. There is even a mummy to see and what I found really interesting – the mummifying process explicative videos. Well now you shall abandon the agreable temprature of the museums cave and go to apply your new knowing into practice. If you are a hiker than it is a great oportunity to leave your car at the interpretation centers parking and go walking. The ravine is full of cave complexes. After visiting the museum you will be able, with a bit of fantasy, to see how was the life in the cave settlements. The presence of many eucalyptus trees is a proof of water souces in the valley that arrive from its upper zones. After the conquest the people moved to the lower areas of Ingenio and Aguimes and the valley became rather uninhabited. But since the beginning of the 19th century people returned and transformated the lower located caves into the cave houses and dedicated themselves to farming. The typical products of the valley are potatoes, corn, wheat, barley, rye, almonds, lentils, peas, beans or pumpking; from animals goats, sheep, cows, pigs and donkeys. From 90ties the number of inhabitants lowered again to approximately 170 persons. You will see some of their interesting cave houses and cave church farther in the valley. Nowadays not everyone works in the agriculture as there is also another interesting business to run – the tourism. Maybe after your hike you would like to get your well-deserved pint of beer or lunch in one of the unique CAVE RESTAURANTS? Cheers! Maybe you didn´t know that more than 500 years ago most of the north of Gran Canaria used to be covered by a large jungle. Only 1% of this original forest survived untill now and in this article we are going to invite you to explore it together with the neighbouring picturesque village of Moya situated on a breathtaking cliff. The village of Moya with its 8600 inhabitants is situated in 490 metres above the sea level approximately 25 kms far from the capital of Las Palmas. The village is literally sitting on the edge of the ravine of the same name, from where you can have impressive views of the ocean and of the bottom of the gorge. In the history all the area of Moya used to be covered with the huge Jungle of Doramas, that used to ocuppy the mayor part of the north of the island. Streight after the conquest of the island the sugar cane had been introduced here which meant that a significant part of the Jungle of Doramas had been cut down and the initial boom of the sugar cane caused the multiplication of the local population. Thanks to the global florescence and prosperity the local bishop Arce decided to built a chappel here dedicated to Our Lady of Candlemas. The church and the parish flourished untill the end of the 16th century when all the area suffered a hard crisis because of the fall of the sugar cane. The church was deteriorating until the 20th century when the local offices decided about its demolition and they a new one was built in the eclectic style, that combinates the elements of neogotism and neoromanticism together with the tradicional neocanarism. The interior hosts several peaces of arts of unmeasurable historical value, for example the statues restaurated by local artist Luján Peréz. In front of the church there is a house where used to live a famous native of Moya, the poet Tomás Moráles, whose house had been converted into a museum, where you can admire the interior of the traditional canarian house, the original paintings and portraits, artists library and his cabinet and another objects connected with his life. Approximately 2 kms far from the centre of Moya there is the entrance into the protected natural reserve of Tilos de Moya, named acording to the abundant tils in the area. Another important and very numerous trees here are the laurels. The reserve is only a tiny part of the formerly huge Jungle of Doramas that used to cover the mayor part of the north of Gran Canaria. 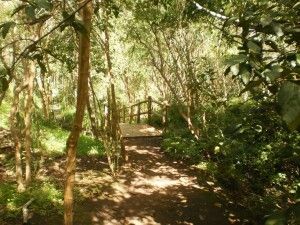 During the 2kms long easy path you will learn about many endemic plants and if you are lucky and patient, you could also see some birds as chaffinch, atlantic canary, blackbird, European robin or grey wagtail, also the giant lizard, Tenerife gecko or different types of frogs. Suprisingly the place have usually very small amount of visitors and mostly they are botanists and zoologists, the entrance is for free and most possibly you will enjoy this unspoild peace of world almost on your own. 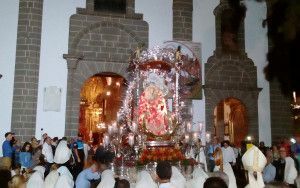 September is the month when all the island of Gran Canaria celebrates the festivities of Our Lady of the Pine Tree. According to the legend the 8th September 1481 a the figure of the Virgin Mary appeared on the top of a pine tree in Teror. Later on there was a storm and the pine tree fell down and the same place was enjoyed to build a hermitage of the Virgin in 1514. The Virgin converted into the patron of Gran Canaria and Teror became an important place of pilgrimage. Eventhough the festivities are more then 1 month long, the main fiestas are celebrated the day 7 and 8th September. The day 7th is the day dedicated mainly to the promises to the Virgen. Thousands of islanders do the pilgrimage, mostly from the city of Arucas to accomplish their promises to the Virgen or to ask her help with their troubles. The day 8th is the day of the official acts, especially the procession with the virgin. The virgin is dressed in a beautiful dress and loaded on a lovely decorated carriage that passes through the well known balcony street. The event is assisted by the soldiers parade, there are many stalls with traditional products and handicrafts all over the center and you would also see some traditional dances in the typical costumes. Our special tip is to visit Teror the evening of the day of Marías. This eyear it happened to be the Sunday 10th September. It is not as busy as the day 7 and 8th, and there is an evening procession followed by amazing fireworks. At the end the Virgin returns back to the church and a worship with the beautiful aroma of incence is celebrated. Apart of the festivities Teror is a lovely peaceful place with picturesque historical center and you can visit it any time of the year on our fantastic Tuesdays (Wednesdays) Gran Tour.